In June, a train carrying highly flammable Bakken crude derailed, causing more than a dozen cars to explode on tracks just hundreds of feet from Choi’s storefront. The derailment in the small, wooded town wasn’t a worst-case scenario. It wasn’t as bad as Lac-Mégantic, Quebec, where in 2013 a train carrying the same type of oil derailed, exploded, and destroyed the city’s downtown, killing 47 people. Still, Mosier was evacuated, forcing Choi and her husband to abandon their home and store for several days. Because much of the spilled oil went into the city’s wastewater system, rather than the river, Mosier’s groundwater is still contaminated from the oil, the town’s Mayor Arlene Burns said. For other residents of the Columbia River Gorge, a dramatic canyon along the Columbia River that forms part of the border between Oregon and Washington, the accident was proof that oil trains are unsafe. After the derailment, hundreds protested oil trains in Oregon—even as a project advanced on the Washington side of the river that would increase oil train traffic there. Vancouver Energy, a joint Tesoro-Savage venture, has proposed to build what would be the nation’s largest oil train terminal in Vancouver, WA, just 70 miles downriver from Mosier. Residents living along the train route on both sides of the river said they opposed the project, saying it offered only risks and no benefits to their communities. The scene of the oil train derailment near the town of Mosier, OR, in the Columbia River Gorge, June 3, 2016. “Whether the crude oil that would support the terminal travels on the Washington or Oregon side of the river, it is still part of the Columbia River Gorge and the National Scenic Area and this affects all of us who live in the region in a negative way,” Burns said. Andrea Neeham, a resident of the Dalles, OR, who works in a winery on the Washington side of the river, said she opposed oil-by-rail. “I’m definitely against oil trains because if we have a spill like Mosier these counties aren’t equipped to deal with it,” Neeham said. 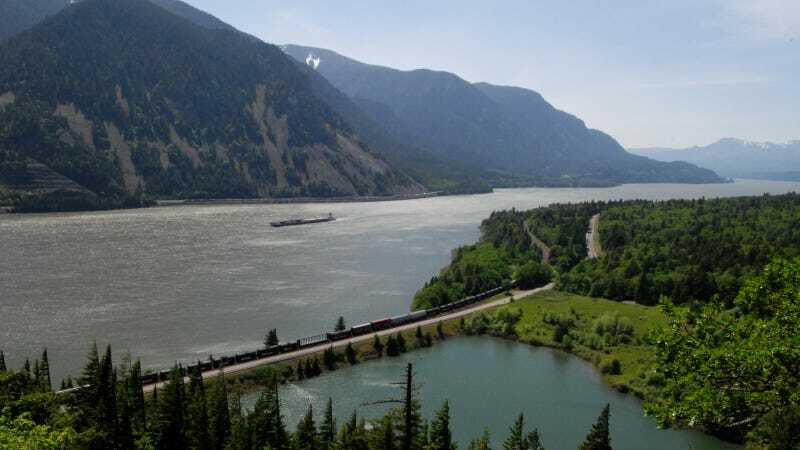 The probability is about “one derailment incident every two years,” according to Vancouver Energy’s Draft Environmental Impact Statement (DEIS) for the project. Not every derailment results in spills, it added. Vancouver Energy is a member of Clean Rivers Co-op and Marine Spill Response Corporation, which have pre-staged spill response equipment along the Columbia River. Dozens of responders and equipment could be at the site of any spill along the river within two hours. In the event of a spill, Bakken crude would likely float on the surface of the river. That is, unless it's windy—which it is most of the time in the Columbia River Gorge. In choppy conditions, the oil could be pushed down the water column and dissolve much more quickly, the DEIS said. Conventional spill response methods of skimming and booming the oil from the surface of the river might not be as effective in those conditions. A view of Lac-Mégantic on the day of the derailment in 2013. A 74-car freight train carrying Bakken Formation crude oil rolled into the city's downtown. Multiple cars exploded, killing 47 people. Jonathan Schwartz, a resident of Dallesport, WA, said he worried about the potential increase in oil train traffic because any spill risked contaminating the Columbia River and its fish. Schwartz said it didn’t make sense that the state would approve any project that could threaten the river and its resources, including salmon, on which billions of dollars have been spent trying to protect. Some Columbia River Gorge residents and business owners didn’t wish to comment on the issue, saying that since the Mosier derailment taking a stand on oil trains had become political. Many restaurants, cafes and wineries are located right on the river, but so are the railroads. The four extra trains per day, each as long as 120-cars, could cause congestion along the tracks and in the towns. Others said overall, the four extra trains daily the Vancouver Energy terminal would add to train traffic was insignificant. “You know how many trains pass by here every day? One train passes every 20 minutes,” said Gerald Cassidy, former mayor of Wishram, WA—a sleepy town at the eastern edge of the Columbia River Gorge Scenic Area. The proposed terminal would accept both Bakken crude and Canadian crude, according to the DEIS. Canadian crude is also known as oil sands, or tar sands, and is among the dirtiest of oils. While Bakken crude is more flammable and explosive than other crudes, tar sands is heavy and must be mixed with toxic chemicals to dilute it for transportation. That mixture, known as “dilbit,” contains chemicals that evaporate much more quickly in the air than conventional crude. When one million gallons of dilbit spilled near the Kalamazoo River in Michigan in 2010, residents who inhaled the toxic fumes complained of dizziness, memory loss, and respiratory illnesses. Dilbit also sinks in water, and is much harder to contain. It could cause long-term negative impacts if it was spilled into the Columbia River, studies have shown. The risky types of crude being transported, and the fact that the oil is just passing through the Columbia River Gorge and Vancouver, means there is no benefit to local communities, a conservation group said. That’s why the Vancouver Energy terminal is known as a “pass-through project,” said Michael Lang, conservation director at Gorge Friends, an organization aimed at protecting the Columbia River Gorge National Scenic Area. “There’s no refineries there, it will be transported to California or Asia, with no benefit whatsoever to the economy of Vancouver or the quality of life in the Northwest,” Lang said. “It’s all risk, so the oil companies just pass the risk on to the surrounding communities,” Lang said. The mile-long trains could also have an economic impact on local communities, according to Rebecca Ponzio, a coalition director for Stand Up To Oil, an umbrella organization of groups opposed to oil terminals and oil transport in the Northwest. Even in Vancouver, where the trains would offload oil at the terminal, the surrounding community is in the midst of an economic endeavor to remake the industrial area with hotels and restaurants, Ponzio said. The Vancouver City Council voted in July to ban all future oil train terminals in the Port of Vancouver. It is unknown if the ban will have any impact on the Vancouver Energy project. Welcome sign on Washington side to the Columbia River Gorge National Scenic Area. BNSF and Vancouver Energy have said they are committed to safety, and defended oil-by-rail saying it was the best option for transport. “No mode of ground transport surpasses rail when it comes to safety, environmental performance, and affordability,” Wallace said. She said only 1232 or newer tank cars are used for shipping crude oil on the BNSF network. The 1232 tank cars were the same that derailed and exploded in Mosier. The 1232 cars were an upgrade to the DOT-111 cars, the type that exploded in Lac Megantic. New federal regulations called for the 1232 and DOT-111 cars to be phased out by May 1, 2025. The rules came after a series of oil train derailments across the U.S. and Canada that showed that the older tanker cars were not safe enough to transport the highly volatile Bakken crude. Under the new regulations, Bakken crude must be transported in DOT-117 tank cars, and Vancouver Energy has said it is committed to accepting only DOT-117 cars or better at the terminal. After the oil is received at the Vancouver Energy terminal, it will be transferred onto ocean tankers and carried down the Columbia River to the Pacific Ocean, said Lang. “This would be a threat to the river everywhere downstream from the terminal,” Lang said. Vancouver Energy has said millions have been invested in deepening the river and that it will require its customers to use expert maritime pilots with decades of experience to guide the vessels down the Columbia River. Despite Vancouver Energy’s attempt to assuage doubts over the safety of the project, residents in the Columbia River Gorge and state officials in both Oregon and Washington have continued to speak out against oil trains. Washington State General Attorney Bob Ferguson told reporters that the potential benefits of the terminal were “dramatically outweighed by the potential risks and costs of a spill,” on July 29 after the review by Washington’s energy tribunal, EFSAC, ended. Next, EFSAC will send its recommendation on the project to Gov. Jay Inslee, who will decide later this year whether or not to approve the project. Mosier’s mayor Arlene Burns said that the train derailment in their town should serve as a wake-up call. “This push for the exportation of cheap crude is misguided at all levels: From the fracking to extract it, to the dangerous transportation of volatile materials through communities…where only a few profit while endangering everyone en route,” Burns said. Correction: The original article stated that Gov. Inslee has until September to decide whether or not to approve the project. There is no such deadline.